Best pals, Ralph (John C. Reilly) and Vanellope (Sarah Silverman), have to travel into the internet to save Vanellope’s arcade game, Sugar Rush. However, their adventures online not only endanger the world wide web but, more importantly, they put their friendship at risk. We ask a lot of our animated features these days. They need to look stunning, appeal to young and old alike, make us laugh, be smart, have heart and say something profound about the human condition. While Ralph Breaks The Internet, the sequel to 2012’s Wreck It Ralph, doesn’t quite tick all of these boxes, Phil Johnston and Rich Moore’s film has a lot going for it - this is a fun and entertaining family-friendly trip to the cinema. As with the original movie, the heart of Ralph Breaks The Internet (or Ralph 2 as I shall now be calling it) lies with the central two characters of Ralph and Vanellope (brilliantly voiced by John C. Reilly and Sarah Silverman). When we first catch up with these characters, Ralph is enjoying his routine-based “perfect” life - particularly the time he spends hanging out with his best friend. While their relationship is as cute as ever, we understand that Vanellope wants more from life. Something edgier and more exciting. When events lead the pair to explore the world of the internet, Vanellope sees all that she has dreamed of in a new game (headed by Gal Gadot’s Shank). However, this new life risks the special friendship that she treasures with Ralph. 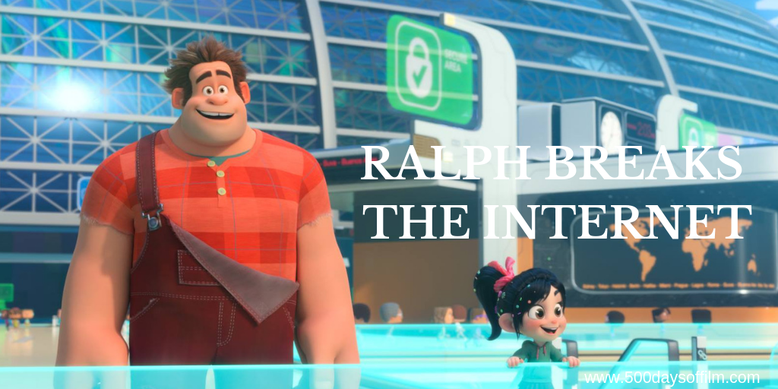 The introduction of the internet in Ralph 2 allows the film to have a whole lot of fun visualising the web and the brands (eBay, Amazon, Google, Twitter and more) that dominate this space. There is too much going on to pick up every (visually stunning) detail on a first watch. However, a couple of sequences stand out. The first involves Vanellope’s interactions with a group of Disney princesses. The animation is wonderful and the writing sharp, relevant and very funny. The second sees Ralph wander into a room full of internet comments. This scene is not only extremely well observed but also a great way for kids to discuss this issue. Ralph is understandably hurt by the comments but ultimately decides that Vanellope’s is the only opinion that matters. After a number of exciting, creative and fast-moving online adventures (the movie never drags despite its long running time), Ralph finally does what the film’s title suggests - he breaks the internet. However, we do not feel nearly as concerned about this as we do about the survival of Ralph and Vanellope’s friendship. Sensibly, their relationship is the focus of Ralph 2’s final act - and it is a moving conclusion indeed. Have you seen Ralph Breaks The Internet? If you have, what did you think of this film? Let me know in the comments section below or let’s chat over on Twitter. You can find me @500DaysOfFilm.